1. Heat the milk and 125ml water very gently in a small saucepan until the mixture feels warm but not hot to the touch. Combine 250g of the flour with the yeast in a mixing bowl, then add the warm liquid and stir to make a batter. Cover and leave in a warm place for about 1 hour or until doubled in size. 2. Meanwhile, place the sultanas or raisins and candied peel into a small bowl and pour over the wine. Allow to soak for at least 30 minutes to absorb the liquid. 3. Place the eggs, egg yolks, sugar, salt and orange zest into the bowl of a stand mixer fitted with a dough hook and beat together with a fork. Scrape the risen sponge dough into the beaten egg mixture along with the remaining flour. Knead with the hook for 10 minutes, or until the dough is elastic. It will be quite wet, but this is normal. 4. While the mixture is kneading, add the butter a spoonful at a time, incorporating it into the dough. Finally, tip in the wine-soaked fruit with the excess juices and chopped chocolate and mix briefly for a final time. The dough should be smooth and slightly wetter than a normal bread dough, but should still roughly hold its shape. Add a little extra flour if it is still sloppy. Place the dough into a large, buttered plastic container or bowl, cover and leave to rise for 2-3 hours, or until at least doubled in size. 5. If you are using individual tin cans, place a circle of baking parchment into the base of each one and line the sides with a rectangle of parchment that reaches about 2cm higher than the tin. If you are baking in a muffin tin, line each hole with a tulip case. 6. When the dough is risen, tip it out onto a lightly floured surface and knead briefly to knock out any large air pockets. Divide the dough into pieces weighing roughly 150g for the tin cans and roughly 100g for muffins and roll into balls. Place the dough into the lined containers, cover and allow to rise for 45-60 minutes, or until almost doubled in size. 7. Preheat the oven to 200ºC, gas mark 6. 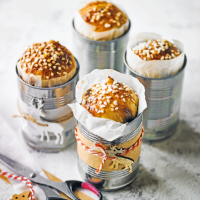 Brush the risen panettone with beaten egg white and sprinkle with pearled sugar nibs, then bake the muffins for 15-20 minutes or the tin cans for 20-25 minutes, until they are a deep golden brown on top and baked through. Allow to cool completely in the tins before eating or giving as gifts. Cook’s tipBrush the risen panettone with beaten egg white for a good golden colour, and sprinkle on sugar nibs for added crunch. This recipe was first published in Tue Dec 04 12:09:21 GMT 2018.